While we all hope that we won’t ever have to deal with a SHTF moment, we are also not as daft to think there isn’t a possibility of it ever happening. Because of this, we prepare, and the handgun is an essential part of our preparedness. As with any tool for survival, the question comes up as to what is the best tool for the job. What is the best SHTF handgun round? In this article, we will give our opinion on the answer to that question and provide our reasoning. There are several options out there that fit the profile for a decent SHTF handgun round, and our selection doesn’t mean that we dismiss the effectiveness of other options. However, after doing plenty of ammo comparisons, we are confident that the 9mm is a great choice. In our opinion, the 9mm is one of the best selections for a handgun round, and that is likely a surprise to many people. In the next several sections, we will outline the reasons why we feel the 9mm is a great handgun round when SHTF. Below we have listed four options that we will take a closer look at to point out the advantages of the 9mm. These selections are in no way a comprehensive list of available 9mm ammunition, but they do represent several of the better defensive and hunting rounds for the 9mm. For the sake of brevity, we had to greater limit the number of rounds we look at for this article. A major plus of the 9mm cartridge is the firearms that are chambered for it. For one, there are numerous options for you from various manufacturers. A few of these include Sig Sauer, Glock, Springfield, Beretta, and Smith and Wesson. Those are only a couple of the manufacturers producing 9mm chambered handguns. While the affordability of these handguns is relative to who is buying it, just about anyone can purchase a well-made, robust, and reliable 9mm. 9mm handguns are also pretty lightweight, especially when compared to the large, heavy hitting calibers that are available. While most of you are probably not as concerned with the weight of the handgun, having a lighter firearm can be beneficial in the long run, especially if you need to move quickly and pack efficiently. We also like the 9mm because of the magazine size. Unlike heavier calibers, the 9mm can be loaded with several more rounds. While the power might not compete with the larger calibers, we think with the right round selection the 9mm can be loaded with 10-15 highly effective “stoppers” cutting down on the amount of reloading in a critical situation. One of the biggest reasons that we go with the 9mm is how easy it is to handle. Now, that doesn’t mean every other caliber is unwieldy. We just think that the 9mm is one of the easier rounds to get familiar with quickly. The low recoil and low muzzle flip allow for rapid, and accurate firing in quick succession. It also provides you with a firearm that your family can easily adjust to and use if needed. As an example, let’s look at the recoil energies that are produced from several 9mm rounds compared to other popular handgun rounds used in similar applications. 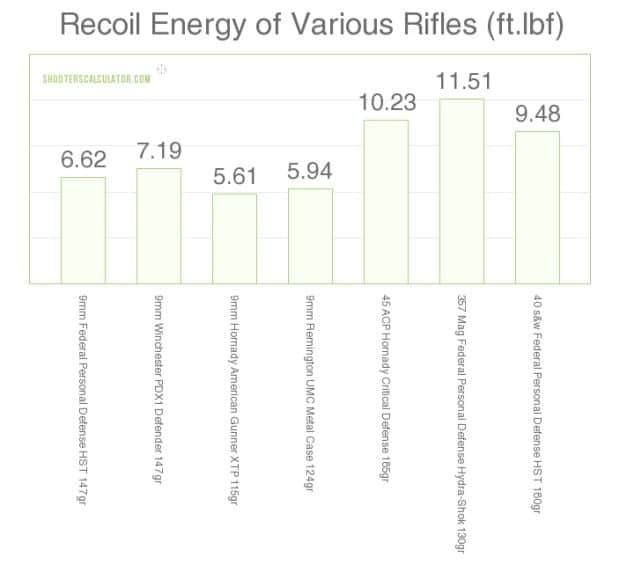 In this graph, we are looking at the recoil energy produced from firing each specific round. 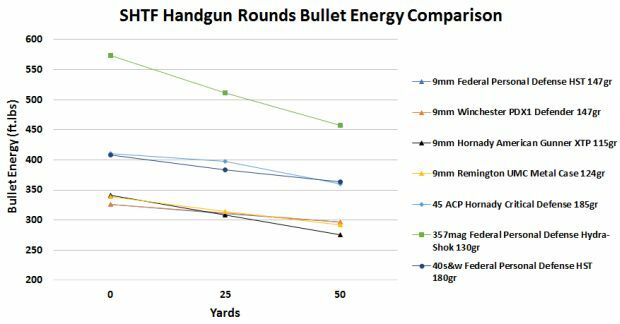 As you can see, the 9mm rounds produce far less recoil than other rounds that are often looked at for SHTF purposes. Most of them are nearly half of the recoil as the other cartridges. While experienced users might be efficient in other cartridges, there is no denying that handling the 9mm in tight situations is going to be much easier for most individuals. The ability to fire off successive shots with accuracy more than makes up for the lack of power, one of the biggest complaints about the 9mm vs the 10mm or similiar harder hitting rounds. While you are not limited to only having a handgun in SHTF situations, it’s still important that each firearm you have show a level of versatility. There might come a time when you need to hunt for food, and maybe you are running low on shotshells of rifle cartridges. Having a handgun that can take game efficiently could be a lifesaver. While the 9mm might not be associated with small game hunting like a .22lr handgun, it is more than effective at taking small game. We have come across a lot of articles and misleading information that talks about how meat damage is an issue, but with our experience using the 9mm for squirrel and rabbit, with the correct round, meat damage is minimal. With the low mass of these animals, there is not as much expansion as when trying to put the round through thicker materials. They are also small enough so that rounds that produce shallower wounds can still dispatch the animal quickly making a lot of available rounds suitable for small game hunting. While we are not claiming that it is one of the best hunting rounds, it can be used in that capacity and with its other properties, it makes it quite a versatile round for SHTF situations. The stopping power is perhaps the most important aspect of a handgun, especially when dealing with SHTF situations. Let’s be honest, in a SHTF situation you should be looking to avoid firefights. In situations where you are mag dumping, the 9mm probably isn’t the top round. For protecting yourself and those around you, the 9mm is still a great option and while many scoff at the stopping power of the 9mm, we think most of them just don’t have a lot of experience with the cartridge. In our eyes, it all depends on the round and more specifically the bullet design. Yeah, there are some cheap options out there that fragment when they hit paper, but there are also deep penetrating and controlled expansion rounds that will more than get the job done. There are several components to stopping power. An easy one to compare is the bullet energy as it leaves the barrel and travels downrange. This force is transferred to the target and damages and destroys tissue and organs. Let’s take a look at the bullet energy of a couple 9mm rounds. We see that there are cartridges out there that have a higher energy than the 9mm rounds. The 9mm rounds all have a muzzle energy between 325 and 340 ft.bs while the three other cartridges all have muzzle energies of over 400ft.lb. Still, the amount of energy with the 9mm rounds out to 50 yards with the well-designed bullets are more than enough to dispatch or incapacitate unwanted guests. Of course, there is more to stopping power than just the energy of the bullet. Velocity, penetration, and expansion all influence how well a bullet is going to perform terminally. The 9mm rounds that we selected all have excellent expansion properties and the terminal velocities at short ranges to do plenty of damage to the target. There is a limit of course, and the upper limits of stopping power some calibers have, the 9mm just can’t compete. For most situations, it’s not going to come into play, but the 9mm does fall short when we think about protection from wildlife such as bears and being able to penetrate dense materials and cover. For the former, it might deter such large predators, but it’s not going to stop them in their tracks unless it’s the perfect shot placement. While the amount you are going to have to pay for a box of rounds is something to think about when preparing for a SHTF situation, you are probably more like us and worry about the performance more than anything else. One of the biggest advantages to the 9mm is how readily available it is. You can walk into any retailer that carries ammunition and you are going to have a good selection of 9mm rounds. As we all know, availability can swing one way or the other depending on what’s going on out in the world. 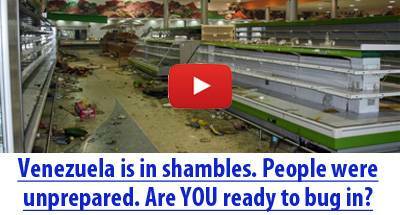 For now, it’s a great time to be stocking up while ammo is plentiful. For the price, the 9mm is one of the cheapest rounds to chamber. And yeah, you get what you pay for, and the $10 box of 50 rounds is probably not going to be the most efficient rounds or ones you want in the magazine when you have to defend yourself. Still, even the better rounds for the 9mm are often less expensive to similar rounds for other cartridges suited for similar purposes. Let’s take a look at some of the common retail prices for these rounds. While at first glance you might think this is only a few dollars cheaper per box, those few dollars will add up when buying for stocking purposes. As we stated before, there are even cheaper options for ammo as well as bulk ammo, but for comparison purposes, we looked at boxes with the same amount of rounds. At the end of the day, the best SHTF handgun round is going to be the one that you can hit a target with. While we have gone with the 9mm, we think other rounds such as the .40s&w, .45ACP, .357, and even others are highly effective rounds and can be invaluable in SHTF situations. Still, for SHTF and bug out situations, the easy to handle 9mm offers perfectly capable terminal ballistics for potential shooting applications. It is light, readily available, and it is a versatile round. It’s not the top of the list for a lot of categories people look at, but as a whole, it is one of the best options to have on you when SHTF. Yes, he did, they were full metal jacket rounds that did not expand at all. No round is an instant one shot stop. I believe the context of the article was that the 9mm caliber is near ubiquitous and easily obtainable and controllable , for the vast majority of people who desire to protect themselves legally. I personally am not enthralled with any 147 grain 9mm bullet loading for self defense purposes, but, if it was all I had…. It’s a good thing there is a myriad of calibers and handguns available to non-thug users here in our Republic. Hondo, There are also many crime shows that state the murder weapon as being a 22lr. 9mm is more than sufficient as a self defense caliber, and has been used as the main combat handgun caliber for many decades around the world. The 9mm produces dead very effectively and should not be treated with disdain too lightly. For that matter the lowly .380 acp is just as useful for defense. For SHTF Plan, 9-mm Beretta CX-4 Carbine & 92f handgun, the mag’s are interchangeable. This is my combo GOTO Choice. Magazines’ range’s from 10 to 30 rounds, and they all fit each other CX-4 & 92f. The power is only a choice of where you hit your Target, but if you had 30 chance’s to hit your Target! There are to many variable for power, bullets & powder. All that is B.S. SHTF you find what you can, and use what you find……..
That was my immediate thought to “the best caliber for shtf”. It’s the one you have. Some times the best shot placement isn’t center mass, if you want your attacker down, a few rounds to his hip is very effective and unexpected. If he is still standing after a couple to center mass, put him down with a couple to the hip.